Australian venture capital funds get pitched to by hundreds and hundreds of businesses on a regular basis, but despite the numerous active funds in Australia, the inner machinations of the types and size of those businesses are often left to guesswork. However, continuing their line of posts aimed to increase the transparency of the VC space, local fund Rampersand has shone a light on the inner workings of the fund’s dealflow — data from nearly 5000 startups. Several thousand new startups are launched every year. Many will die, some will mature into decent sized sustainable software businesses, and a small but growing cohort go on to achieve the rate of growth and size many startups dream of such as Expert360, Safety Culture, Spaceship, Assembly Payments, Vinomofo and Airtasker to name just a few. Alongside founders and teams thriving, the venture capital industry has burgeoned as well. Many more funds have launched, and the fund size has grown significantly. We now have around 10 Australian funds building promising portfolios. The growth of the local venture industry has been a good thing. The volume of funds available is far greater and the variety of funds means Australian VCs back a more diverse set of theses. Most importantly, founders have much more information about which funds are best for them. This is great news for everyone — empowered founders that find the best funds for their particular needs (beyond just capital) are the most likely to succeed. Also, funds now have a deeper set of data and experiences upon which to support the companies and the decisions that are made. This enables smarter decisions leading to more sustainable and successful funds, which leads to more qualified risk taking. And yet the venture capital scene remains remarkably opaque. This week I caught up with three women with strong track records in tech who are interested in moving into VC, as well as 11 founders and all of them articulated the sense the actual mechanics of VC are unknown — a black box to them. This is probably partly because the Australian venture capital is a small community of maybe 70 people, and it can be pretty competitive. But this mysteriousness, especially for founders, is far from ideal. Many startups live and die based on their capacity to raise funding, and founding teams deserve every support they can get because launching a company is an incredibly gutsy thing to do. So today, I want to share with you guys some insight into what a venture capital fund’s pipeline looks like. The below graphs are drawn from the nearly 5000 companies logged in our CRM since 2013. It’s by no means complete (the records keeping in the early days may not have been has good as it could have been! ), and it also looks primarily at the inbound flow (i.e. companies approaching rampersand, rather than vice versa) but is hopefully a helpful data point or two about what the Australian startup ecosystem looks like. What kind of startups are pitching VCs? 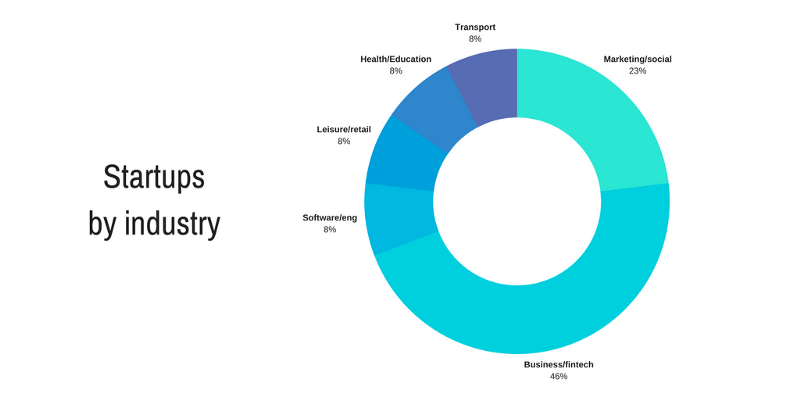 The below categories are very broad, but hopefully gives a sense of the volume of activity in each industry (keep in mind not every startup needs or wants external capital). We don’t categorise each company with every kind of tech it involves, ie AI/ML/blockchain/robotics etc, as usually there will be several different technologies used in each startup. Instead, we organise them by the industry they are looking to improve. The dominance of business processes and fintech here wasn’t a huge surprise to our team. Several of our highest profile portfolio companies are in this category, and enterprise software in particular is one we love, and are well equipped to invest in and support. What kinds of products are we seeing? Product is an imperfect term for this category, but I wanted to give a sense of the kinds of business models and technology focuses we are seeing. So there is some overlap between categories in this one (for example you could be blockchain and marketplace). It’s also worth noting that the first graph below represents the sum of companies we have seen since 2013. Through that five year period there have been considerable ebbs and flows in different product/technology platforms. 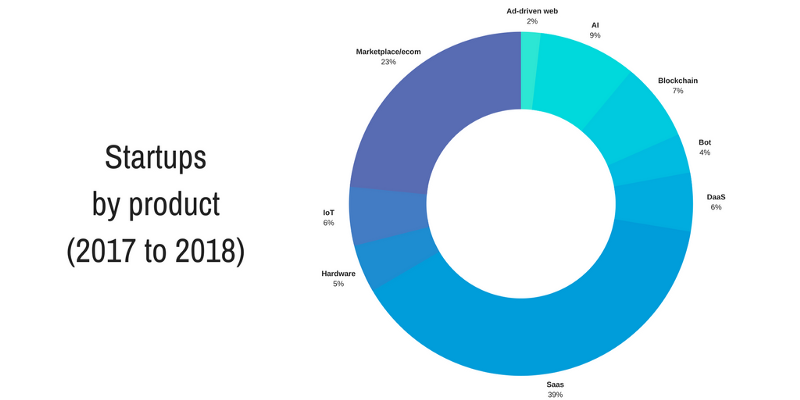 > Marketplaces: Australian tech founders love their marketplaces, which makes up 43% of the businesses we have seen over the past five years. This is perhaps not surprising as our earliest tech unicorns, Seek, CarSales, REA and more recently 99designs were marketplaces also. However, since late 2015 we have seen a decline in two-sided marketplace models relative to other business models. > Saas: Around the same time, we saw the rise of software-as-a-service (Saas) companies. This is a broader technology shift but locally also one that was likely inspired by companies such as Atlassian, Campaign Monitor, Canva and Xero. > AI and Blockchain: By mid 2016 the team saw the strong emergence of AI and Blockchain business approaching rampersand, with 50% year on year increase both, which continued through 2017 and into this year. What stage companies are pitching to Australian VC? There are no big surprises in the below graph. Rampersand is a specialist early stage fund, focusing on seed and Series A investments so we were always going to be overweight on those. What do these labels even mean? Great question. It varies and people often use these labels for the amount of capital, rather than its primary purpose ie a seed round is anywhere from $150,000 up to about $2 million, and Series A (in Australia) is anywhere from $2million up to $20 million. Our view is these labels are more useful to describe the stage and needs of the business. 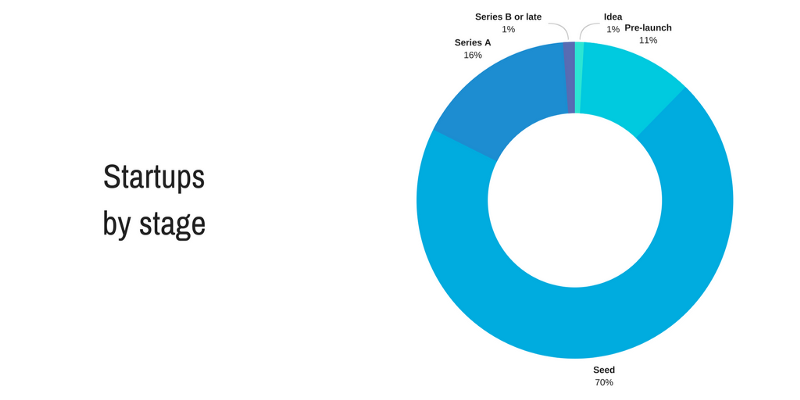 A company that is raising seed capital from VC funds (rather than angels who will go earlier) will usually have a few customers, a bit of revenue and some promising indications they have or are moving towards securing product market fit. Whereas companies raising Series A have secured that, mostly got their operations in order and are ready to start really scaling that. Given most startups don’t get past the seed stage, this stage’s dominance in the graph below makes sense. What might be more interesting to founders is the 11% of companies that have reached out to us before they launched. We don’t invest pre-revenue, but it’s never too early to start a conversation with an early stage VC (so make sure you say hi if you’re working on a startup). And finally, where are these companies based? This graph may come as a surprise to many of us in Sydney — it did for me when I first saw it. But the Melbourne ecosystem is growing and most of our team is down there, hence why such a large cohort in the pipeline are Melbourne companies. We have recently set up a Sydney presence to make sure we are as accessible as possible for the Sydney community but we know there are many more startup communities than just those two. This is why the team is getting around the country and to NZ much more regularly. 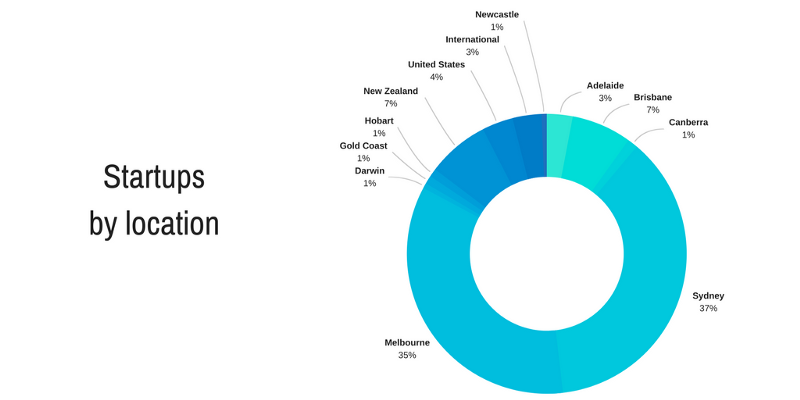 Our portfolio companies’ headquarters are split pretty evenly across Sydney, Melbourne and the US/UK. We are actively looking to invest in a wider geographic spread of companies, and there is a lot of exciting startup activity going on in Perth, Brisbane, Adelaide, Auckland and Wellington to name just a few key cities of interest to us. This is an edited version of a post that originally appeared on the Medium page of Rampersand’s head of growth Rose Powell. Powell was previously a reporter at StartupSmart.